Also, can the CC GOP make up for national shortcomings in organization? 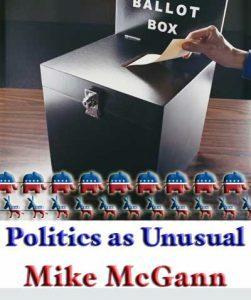 Well, when it comes to politics and particularly those Republican candidates running down ballot of Donald J. Trump, it appears to be more of the latter. I give you a tale of two candidates, both of whom I know to be smart, with-it guys, who are at their essence, policy guys. Sen. Pat Toomey and U.S. Rep. Ryan Costello (R-6). Toomey who faces an unfairly tough race against Democrat Katie McGinty — a candidate seen by many as not overly qualified and shoved down the throat of Pennsylvania Democrats by the party’s elites — has artfully avoided anything like endorsing, supporting or even acknowledging Trump. Instead, he’s pushed modest gun reform bills in the senate — a move that enhances his credentials as a moderate voice — and a high profile battle against so-called sanctuary cities, including Philadelphia, where local police are barred from working with Immigration and Naturalization to find and deport illegal aliens, especially those with a history of violence. Even many of those in support of immigration reform are uncomfortable with the idea of keeping local police from working to enforce current law — again, the sort of issue that plays well with moderate voters in places like Chester County. Costello, a freshman running in the competitive Sixth Congressional District, has generally also run to the middle, going out of his way to burnish his bipartisan, moderate credentials — a similar approach to that of U.S. Rep. Pat Meehan, a Republican from the neighboring Seventh Congressional District. But in a moment of panic — confusion, terror, brain contusion, I don’t know, something — in May, Costello endorsed Trump for president, shortly after the New York Real Estate Billionaire appeared to clinch the GOP presidential nomination. Despite having been given all the cover in the world by House Speaker Paul Ryan, who only grudgingly and much later allowed that he would support Trump for the good of the party, Costello charged in and charged in early, likely tying his fate to that of Trump’s. I’ll note Meehan and GOP candidate Lloyd Smucker in the 16th, have barely acknowledged Trump, let alone endorsed him, much like Toomey. Costello’s unforced error has given a weapon to wildly underfunded Democrat Mike Parrish — who seemed destined to lose badly to Costello as recently as April. The surprisingly large contingent of anti-Trump Republicans in the county are quietly steamed — and thinking about staying home on election day to make their point, while others seem ready to “bullet vote” — voting, but only voting for the candidates they really support — meaning such a Sixth District voter might find themselves say, skipping the top of the ticket and maybe the congressional race, but voting for Toomey and their state legislative candidates. With turnout already expected to be a challenge — Trump has virtually no field operation in Pennsylvania — this could make a district rated by The Cook Report as R+2 (it means the average GOP candidate holds about a 2-point advantage over an average Democratic candidate) scarily competitive. National media is already starting to look at this race, which could mean national fund raising dollars for Parrish (coming from angry, anti-Trump Democrats around the country), the last thing that Costello should have wanted to encourage. Maybe it all works out for Costello — I guy I think has a bright future — but from here, right now, this seems like a needless, unforced error. Much has been written about Trump’s lack of organization and its possible impact on Republican down-ballot candidates. While Hillary Clinton already has numerous operatives working in Southeast Pennsylvania, including a full media team operating out of Philadelphia, there appears to be next to nothing on the ground for Team Trump. If there is a silver lining to the Trump cloud for Chester County Republicans its this: the county organization remains strong in get out the vote (GOTV) efforts and has in recent years been the difference on the ground. In fact, in 2012 many noted the poor coordination of the Romney campaign and its lack of resources in a county that Barack Obama had barely won in 2008. Despite the poor performance of the Romney campaign here, it was local Chester County Republicans who ran the strong GOTV and local messaging which led to a Romney win county wide. One major difference: Romney did have money, and a goodly amount got channeled through PACs to state and county committees to help with the effort. Right now, it appears that Trump will be woefully short on money. Some of the money is staying on the sidelines, while other funds are going to fund down ballot candidates. It’s something to watch as the election race runs into the fall. Meanwhile, local Democrats look to inherit the strong Obama national campaign structure and data system which has largely been handed over to the Clinton campaign. In the last three presidential cycles, much of the GOTV work has been managed through this process with varying degrees of success. The local Democratic party is getting better at campaign operations and messaging — a change of leadership has had some positive impact. But they were so far behind local Republicans in everything from fund raising, committee person recruitment and training to local messaging, in part because of more than a decade of misguided, ego-centric leadership, that it is going to take quite some time to build an effective organization. Speaking of messaging, it was exceptionally low rent of the Republican Committee of Chester County to post a Facebook rant Monday blaming Gov. Tom Wolf for a ban of trucks on I-95 during the Democratic National Convention later this month. As much as I love a good social media rant, one that so was fact-challenged it would make Trump blush, signals a certain desperation, kind of like watching a fading Ryan Howard try to hit an inside fastball. The restrictions were put in place by the U.S. Secret Service, not Wolf, and similar restrictions will be used in Cleveland next week for the Republican National Convention. It’s pretty typical stuff these days in a world of truck bombs and terrorist threats. Maybe our friends at RCCC only ought to let the grown ups use the social media stuff, you know?